To understand the recurring problem of Algae and Moss growth on rooftops it is important to learn what they are and how they grow and spread. Although some similarities exist, algae and moss are very different and require slightly different procedures to prevent or to remove. Often mistaken as mold or mildew , the black discoloration and streaks visible on many roofs across the United States and Canada are actually algae. The algae can form where moisture tends to dwell on roof surfaces, most notably the North Side. Coastal or humid climates create the most conducive conditions for algae growth. Algae can eventually team up with a fungus to form a Lichen. The most common type, gloeocapsa magma or blue green algae, protects itself from damaging ultraviolet rays by producing a dark pigmented sheath. 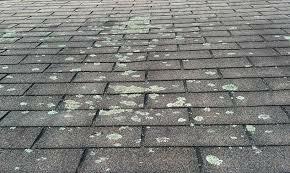 The algae discoloration typically begins as small spots then quickly transforms into Black Streaks on the roof plane. By the time the algae is visible, it likely has been present for several months or longer. Algae spores are carried by the wind or by animals and can quickly spread from one rooftop to another. That is why it is common to see algae growth on rooftops throughout an affected neighborhood. The same is true for apartment or condominium complexes, townhouses or row houses. There is no scientific evidence that algae is damaging to asphalt shingles, although it certainly affects the aesthetics of a roof. On highly reflective or "cool" roofs, algae will undoubtedly have a negative impact on the long-term effectiveness of these roof systems. That is why it is important to address an algae problem as soon as possible. Moss is a non-vascular plant that obtains water through its leaves, unlike most plants that gather water through its root system. Moss must therefore have a moist environment to survive. In North America, moss tends to grow on north facing roof planes that receive less direct sunlight and stay damp longer than south facing planes. Overhanging tree branches provide additional shade and drop debris on the roof that further holds in moisture and acts as a food source for moss. Moss spores may also be carried by wind or animals and can easily spread throughout neighborhoods. Unlike algae, moss can be detrimental to asphalt shingle performance. Moss can cause the leading edges of the shingles to lift or curl, which increases the risk of shingle blow -off during wind events. In severe cases, moss build-up can cause lateral water movement resulting in moisture damage to the roof deck or may even cause roof leaks. Algae and moss growth on roofs, at a minimum, is an unsightly nuisance. 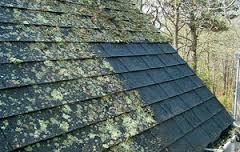 Moss build-up can lead to roof damage or shingle blow-off if left unchecked. Keeping branches trimmed back from the roof and removing any debris that begins to accumulate should be part of a regular roof maintenance program. If moss or algae becomes visible, clean the roof to prevent the spread to nearby roofs.